By Christopher Blakeney A blistering wind howls through the hills, scorching the land and any living thing unfortunate enough to be caught out on the snow-covered expanse. The animals are wise, for they seek refuge in their cozy burrows. Not even the soft chirruping of birds can be heard across the tortured landscape. Yet there are people here. Skiers are among the brave few willing to venture into this beautiful emptiness. Among the toughest of sports, skiing demands enough grit to withstand the bitter cold, and enough strength to climb grueling mountains, and enough balance to remain upright with thin strips of fiberglass lashed to one’s feet, and enough courage to plummet down and around twisting corners on abandoned slopes. But, despite all these challenges, Lisgar skiers have trained through the dead of winter, and, consequently, they’ve become rather good. With dedicated veterans combining with many eager novices willing to try this perplexing sport, the Lisgar ski team has become one of our school’s best teams, and, this year, it may have been the most successful. Admittedly, it’s hard to compete with their record. Not only did the team dominate at cities qualifying 11 people for OFSAA, including Eric Nussbaum who qualified individually, but they were also, with around forty skiers, the largest team there. This was partially a result of the large group of intrepid novices who made Lisgar proud despite their minimal experience on snow. But Lisgar’s success did not end there. For the most part, simply making OFSAA is a feat worthy of some boasting; however, the Lisgar team did far more than that. Simply put, they were magnificent. From the very first event, Junior Girls individual, where Alia Sanger won bronze and Anna Billowits placed 11th of 130, to the last event, Senior Boys individual, where Isaac A-C won bronze, Christopher Blakeney placed 4th, Marcus Nussbaum placed 5th, Julian A-C placed 7th, and William Wu placed 57th of 146, they dominated the frigid hills of Timmins. Incredibly, the Junior Girls team of Alia Sanger, Anna Billowits, Julia Maine, and Sydney Martin won silver in both the team distance and sprint events. However, the greatest victory came from the Senior Boys team. 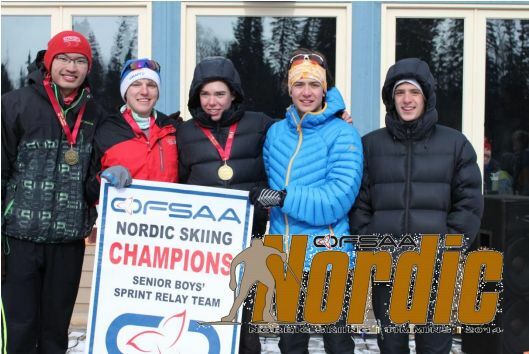 Not only did they return triumphantly with two OFSAA banners, one each for the Senior Boys team distance race and the Senior Boys sprint relay, but they also set the OFSAA record for the Senior Boys team event. To calculate the team score, the placement of each of the top four skiers is added giving a minimum score of 10. Our team scored 19 points. With all four athletes in the top 7, it’s no surprise that they won,but setting a new record brings its own special glory. Of course, for these spectacular results, more training than one simple season is required, so skiers find creative ways to practice and race all year long. If you ever see someone roller-skiing down the street, take a good look because that level of athletic dedication can only be found in a skier.